Probably the best way to discover the north of Spain. The trip starts in the Pyrenees surrounded by mountains and deep forests, to continue looking south west towards the well known Rioja wineries where Romans developed the art of making wine. After Rioja, Castile with its endless growing fields of cereal and sunflowers greet us when passing. The Romanesque and religious expressions have their great moment going up hill over the mountains of Leon, and achieving the “Iron Cross” as a maximum for the pilgrims. The trip finishes in Galicia, surrounded by ancestral chestnut trees, lost villages, and magical legends. The final entrance to Santiago and its lively old town full of knowledge is just the beginning of a new experience. Be a pilgrim! Starting point at the French border in Saint Jean Pied de Port. Meal at a Gastronomic Club in San Sebastian. A resting day on the way visiting a winery at the “Bierzo” region. 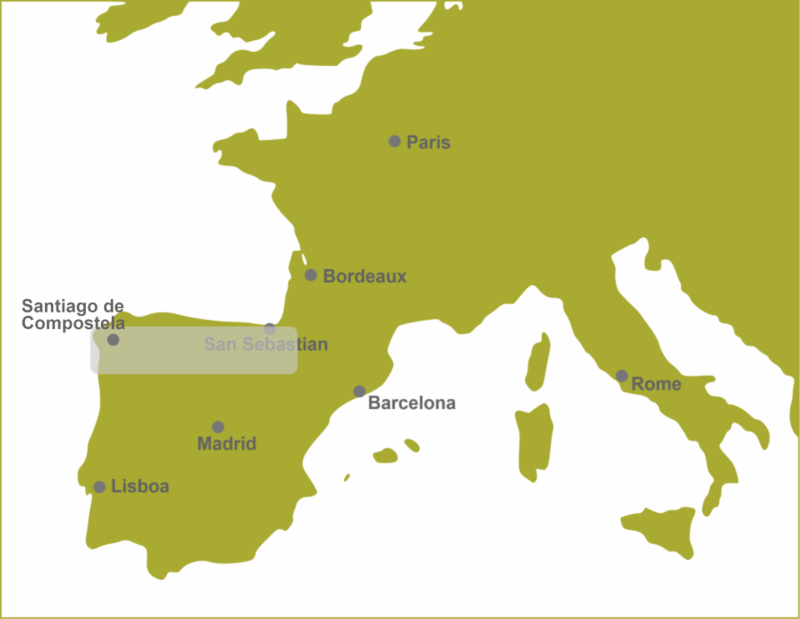 Starting point San Sebastian and finishing in Santiago de Compostela.